Miserable Pile of Secrets: The Essentials #12: Pac-Man vs.
Generally regarded as the first character in video games, Namco's Pac-Man has endured for many generations as the company's beloved mascot, but, as of 2003, Pac-Man had not managed to successfully break out beyond the original design of his first title, rendering him mostly useless and irrelevant as gaming continued to evolve. That year's release of Pac-Man vs. tried to breathe a bit of new life into the character, resurrecting classic design, while simultaneously showcasing Nintendo's experimental connectivity technology. 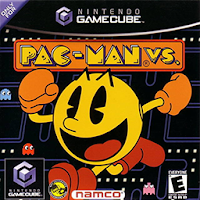 Pac-Man vs. was the product of Nintendo's own legendary designer, Shigeru Miyamoto, who sought to put a new spin on the classic arcade game by giving it a versus mode. The concept was simple yet inspired. One player would control Pac-Man playing the game as normal, gobbling up the Pac-dots littered about the maze, while evading the ghosts that pursued him. Consuming one of the handful of Power Pellets would let him turn the tables temporarily by granting him the ability to prey on the ghosts. The new twist, however, had up to three other players controlling those ghosts as they stalked Pac-Man. Each ghost would have only a tiny circular field of vision, forcing them to wander about the board until they got close enough to catch a glimpse of Pac-Man, at which point they could try to use their faster linear speed to chase him down. Fruit, which originally just gave Pac-Man bonus points, could now be eaten by ghosts as well, and doing so would widen the display circle for the player that collected it. While best enjoyed with a full four players, the game would keep the sides balanced by having the AI take command of any ghosts that were not controlled by human players. Initially transparent and intangible, an AI ghost would take on the color of the first player ghost to tag it, at which point it would be able to hunt as a representative of that player. 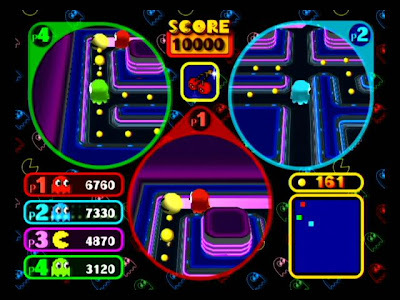 Pac-Man vs. was the second of only three titles to be designed specifically around use of the GameCube-Game Boy Advance Cable. Utilizing a more manageable and considerably cheaper setup than Final Fantasy Crystal Chronicles or The Legend of Zelda: Four Swords Adventure, it required only one GBA and GC-GBA Cable for controlling Pac-Man on the handheld screen. The other three players, who would control the ghosts via the TV screen, played using GameCube controllers. Any ghost player who managed to catch Pac-Man would earn the right to play as him for the next round, and the exchange was handled simply by physically handing off the GBA from one player to the next. This would continue until a player managed to reach the score set as the goal at the beginning of the match. Though the fast pace and simple, intuitive mechanics made for a fun party game, there were definite flaws in the design. The player controlling Pac-Man would have an overwhelming advantage thanks to his much greater field of vision. Armed with that superior knowledge of any given stage's paths, the Pac-Man player would not have much trouble eluding a mere three ghosts. If a ghost did start to threaten him, he needed only to grab the nearest Power Pellet and send them all fleeing, at which point he could either hunt them for the extra points or continue collecting Pac-dots at his leisure. By carefully pacing his consumption of the Power Pellets, Pac-Man could dominate a board and rack up a lot of points in very short order. In theory, the ghost players were supposed to communicate, so that they might coordinate their movements and trap Pac-Man, but, in practice, this was actually fairly difficult. Due to the abstract nature of the levels, it was only possible to give vague directions, such as "bottom-right corner" or "middle of the stage," which, with the speed at which the characters moved, would not likely remain accurate long enough for any plans to be concocted, especially if Pac-Man did the logical thing and grabbed the nearest Power Pellet. More importantly, even though all the ghosts wanted Pac-Man eliminated, the fact was that they were also in competition with one another, and it was undesirable for a ghost other than yourself to catch him and earn the right to become Pac-Man for the next stage. Depending on where everybody stood on the scoreboard, a fellow ghost could actually be a bigger threat in the grand scheme than the current Pac-Man, in which case teamwork might be discouraged. 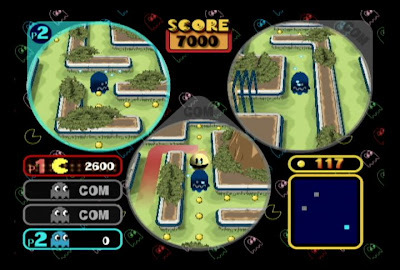 The one trick available to the ghosts was the ability to cheat Pac-Man out of a clear board by deliberately camping over the last Power Pellet or two, or, if there were none left, then the last couple Pac-dots. The game would try to prevent such a tactic by making all dots and Power Pellets disappear from the ghosts' screens once the remaining dot count was down to twenty-five, but this could not stop a player who was determined or desperate enough. It was a cheap maneuver, to be sure, but letting Pac-Man clear the board was the worst-case scenario for the ghost players, as it meant the same player would control Pac-Man for the next round, and likely be in striking distance of the match goal. Of course, between just Pac-Man and the camper, it would be a virtual stalemate. The camper could not pursue, while nothing forced Pac-Man to go for the last dot. Since there was no time limit, unless the two remaining ghosts caught him, the game could drag on indefinitely. Eventually, someone would have to break. Either the camper would realize that he needed to catch Pac-Man himself, or the Pac-Man player would give up and decide which of his opponents he felt most comfortable handing off to. All scenarios considered, Pac-Man still had the upper hand. Despite Pac-Man's advantages, it still took a fair bit of focus for a Pac-Man player to run away with things against superior numbers. Amid the sort of party atmosphere that was likely to accompany a session of Pac-Man vs., this focus would prove far harder to maintain than in the original single-player game. While the problems would likely arise, they would not detract significantly from the sheer fun of the experience. With just six boards to play on, the multiplayer-only title was extremely limited, which was surely why it was distributed only as a freebie with three other Namco releases of the time. My copy came as a set with the Player's Choice release of Pac-Man World 2, a reportedly mediocre platformer that I have never bothered to play. Though not as richly involved as Final Fantasy Crystal Chronicles or The Legend of Zelda: Four Swords Adventure, Pac-Man vs. made the best case for connectivity. As a game that truly utilized multiple screens alongside the social aspect of local multiplayer, it offered a familiar yet utterly unique experience deserving of a look for any GameCube and GBA owner. Namco Bandai wisely chose to give the game a second chance by including a DS conversion in its release of Namco Museum DS. Clearly the compilation's main attraction, it practically justifies the collection by itself, and it kind of has to, unless you're really into classic Namco arcade games. The conversion is very faithful and clearly establishes the lineage between the GC-GBA connectivity experiment and the dual-screen design of the DS. The ghost mode graphics are certainly not as slick as the 3-D presentation on the GameCube, and it lacks the cute audio play-by-play by Mario, but the portability and ubiquity of the DS expands its reach significantly, and, with single-cart play for up to four players, it provides a convenient pick-up-and-play multiplayer experience that just about anyone should be able to enjoy.